BREAKFAST IN BATH AT THE STONES HOTEL KUTA BALI - Caption would be when you woke up at 10 AM, but there's too much to handle (lazy) for buffet breakfast in the restaurant, this will be a good answer. 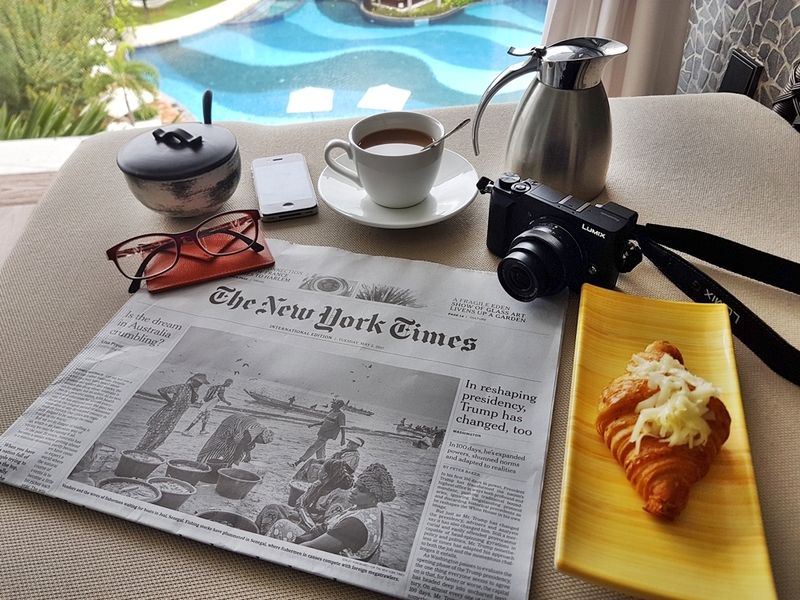 The instagram world crazy about floating breakfast, and some hotels spins their head to offer something new to the guests and the social media world. But are you really going to enjoy breakfast while half of your body inside the water? I was, and now I am kinda, do I will going to do again? I give the 8 for the series of Sundanese menu from entree to main courses to the desserts, it was impresive. But I missed the couple thing on the authentic menu, like deep fried carp fish (Gurame Goreng), Deep Fried Seafood, with less oil, I mean we use oil a lot, and what I find here is the menu that more to greasy than to deep fried. We love vegetables too, but I can't find it, but it's okay since everyone are probably won't like it like the real Sundanese. So yes, please come at the day, The Long Rice Table serves you "Urang Sunda" and take everything on the buffet to spoil your mouth and belly!